Allergies can be caused by many things, such as foods, medicines, pet dander, insect bites and other seasonal allergens like grasses, molds, yeasts, weeds, pollens, smoke, etc. These will trigger the release of histamines in the bloodstream. The people who are experiencing the allergies, they suffer from certain symptoms like hives, rash, wheezing, sneezing, runny nose, itchy eyes and throat, etc. Never ever neglect the treatment for the allergies as this could lead to anaphylaxis, where you have difficulty swallowing, shortness of breath, loss of consciousness, dizziness or even death. It contains curcumin, a compound that acts as a decongestant. It acts as an anti – histamine which helps in reducing the mast cell de-granulation or histamine – release. It can treat both tonic and acute allergies effectively. It has anti-inflammatory, analgesic and anti-bacterial properties that help to cure allergies and other health problems. Curcumin, when mixed with other effective herbs like licorice root or extract of boswellia, it becomes very effective in giving relief from immunological reaction to clear allergies. It acts as a natural leukotriene inhibitor for allergies, which is related to a particular form of allergic condition called bronchial asthma and other lung problems. Add a sufficient amount of turmeric powder to your foods while cooking. Like: milk, curries, fries, rice items, salads, etc. Include this turmeric regularly in your diet plan. This process is used to cure allergies and the itchy throat symptoms. Try this method regularly either in the morning or at night time. Add turmeric powder, black pepper and honey to boiling milk. Stir well until the turmeric has mixed properly in the milk. Drink on an empty stomach or before going to bed. Regular intake of this turmeric milk for 2 – 3 times a day will help to clear the allergic reaction. The turmeric has anti – bacterial and anti – inflammatory properties that help to cure allergies, while honey helps to soothe the allergy infected areas. Mix turmeric juice and raw honey in a bowl. Consume a spoonful of this mixture. Consuming this mixture regularly until the allergy has gone. Mix powdered turmeric and raw organic honey until it forms a paste in a bowl. Consume a teaspoon of this mixture and store the rest in a clean glass jar for further use. It is used to treat many beauty and health ailments including the allergies. Pour turmeric powder and water in a small saucepan over the stove. Stir it well until it becomes a smooth paste. Boil it while stirring frequently. Reduce the heat and allow the mixture to simmer until it thickens. Take off the heat and allow it to cool. Store in a container and keep refrigerated. Consume this by adding in fruit juices or any liquids. Regular consumption will yield better results over allergies. Add turmeric powder to warm water and mix well. Add honey and stir it in. Drink this turmeric tea regularly to treat seasonal allergies. This process is exclusively used to treat sinus allergies and helps to relieve you from pain and the discomfort caused by sinus allergies due to its anti-inflammatory property. Blend turmeric roots to get ground turmeric. Add freshly squeezed lemon juice from a whole lemon. Add honey, cayenne pepper and a little of water. Stir well to make a turmeric smoothie. You can also add a piece of banana for additional taste. Drink this turmeric smoothie regularly to preventsinus allergies. This process is used to treat facial swelling that can be caused by allergies. Add equal quantities of red sandalwood and turmeric powder into little water. Mix to make a fine paste. Apply on the face gently with your hand. Let it sit for about 30 – 40 minutes and then rinse off with lukewarm water. This process gives a soothing relief from redness, tenderness and swelling. Whisk ground turmeric in a mortar and pestle to make a fine powder. Place in a bowl and add raw honey, lemon zest, organic, unfiltered apple cider vinegar and a pinch of black pepper. Consume a tablespoon of the mixture. Store the remaining mixture in an airtight container and keep refrigerated. It will last about a week. Alternatively, mix a tablespoon of turmeric mixture in 12 – 16 ounces of warm water and drink. Or add a tablespoon of turmeric mixture in your smoothies. You can also take a teaspoon of paste and spread it on the top of the toast. Continue daily to get complete relief from the allergies and boost immune system. Mix turmeric powder and olive oil to water. Add a pinch of black pepper powder and mix all ingredients together. Consume this daily to get relief from the seasonal allergies and asthma. Add pure organic turmeric powder to water. Stir well and drink regularly. You can also take vitamin C enriched fruits and vegetables to enhance the immune system. 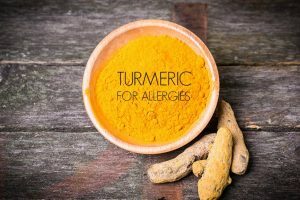 You can also take turmeric in supplement forms like capsules or pills to get rid of seasonal allergies. Most people take 500 mg of turmeric capsules once a day on a regular basis to clear up the problem. Make sure to consult your doctor before taking these capsules. You can also use this in tinctures, smoothies or drink with nut milk. Avoid using turmeric milk if you’re allergic to dairy products. Use soy milk as a replacement. Sprinkle black pepper on turmeric recipes to assimilate turmeric more effectively. Make sure to check if turmeric is suited for your skin and body, as some people are allergic to turmeric. Turmeric can causes stains on both clothes and body. Make sure to consult your doctor before using these methods as the U.S Food and Drug Administration has not regulated these herbal remedies for treating allergies. Consult the herbal practitioner or your doctor before using turmeric for allergy treatment to know about the dosage and the timing along with your present health condition for more effective results. Do you know any other turmeric methods for allergy treatment? Then feel free to share your experience with us. Is turmeric with milk is beneficial in urticaria and urine infection? what quantity one should take in a day? Yes, it can. You can take 2 – 3 grams of turmeric powder per day. Hello mam, did u try this? What is the result? Why would I need to mix turmeric with milk,black pepper and honey for hay-fever/allergies? Cant I just use turmeric by its self? I have a sensitivity to black pepper. Also does using ground turmeric alone work to cure allergies or do I need to purchase the turmeric that has been processed having refined and pure curcimin? whats the difference? And if I do need store bought turmeric/curcimin which brand is the best not just having useless fillers etc. If you are allergic to black pepper then avoid using it. You can just add turmeric to milk and drink it. Use only ground organic turmeric powder. Avoid purchasing refined turmeric powder. If I am allergic to peanuts, can I drink Tumeric tea? I am suffering from skin allergy and been drinking 2 cups of turmeric in hot water and black pepper twice a day but so far not much effective to cure my allergy. Should I increase it to 4 cups a day. I am also taking Loratadine 10 mg 1 tablet a day since last 5 days as the Doc prescribed for allergy but no relieve so for. Could you please help what else can I do to get rid of my allergy. Apart from drinking turmeric with hot water, try this process as well. Combine 1/2 teaspoon of turmeric and enough amounts of milk to form a paste. Apply the paste on the affected areas and leave it on for 10 minutes. Rinse with warm water and pat dry. Repeat the process regularly. I am suffering from skin hives or may be called urticaria. When i go to cold areas and come back to hot temperatures then i got skin hives and i am very sad for this. could u please solve my problem? Apply cold compress, aloe vera gel or diluted apple cider vinegar to get relief from the itching and irritation caused by hives. Apart from reduce stress levels as it can aggravate the problem, avoid hot shower baths until the allergy reduces completely. Hiiii I HV allergy to dust n smoke …..suffering from sneezing n running nose since 2 years …….what should I do???? Limit your exposure to dust. Clean your bedsheets and pillow covers twice in a week. Vacuum the carpets and upholstery regularly. Clean and mop the floors daily. Get rid of stuffed toys and animals. Maintain humidity level in your home below 50%. Consume turmeric milk (method mentioned in the article) to improve your immunity and fight off the infections as well as allergies. Yes, turmeric may help to provide relief from the swelling and other symptoms. Try the remedy regularly until you find some relief. I have started drinking golden milk once a day for about a month now. How long do I need to drink this before seeing results? Also is once a day enough to have the good benefits of turmeric? You have to follow the method daily until you get complete relief from allergy. Once in a day is more than enough to have the good benefits of turmeric. I am suffering from hives or urticaria since 2 month . please give me some natural ramidies to cure it permanently. Apply freshly extracted aloe vera gel on the hives. As it contains anti-inflammatory and anti-microbial properties which helps to reduce hives. I am currently on Claritin and sometimes benydril but I’m also on an inhaler….does tumeric interact with medicines? Turmeric may interact so we recommend consulting doctor before trying them. doctor told me afte spirometry test mild obstruction ventilatory defect with no significant reversibility of fev1 after adminstrator of bronchodilator .and advice me to take lokotas tablets for this.can advice me for termuric powder honey lemon benificial for this treatment.also my both nose blocked.please advice me how to rectify. Use the quantity depending on the affected area. You can start with two tablespoons of turmeric powder. Mix it with some water to make a paste. Apply it on the affected areas and leave it to dry completely. Rinse off with water and pat dry. Repeat the process daily until allergy reduces. Try any method mentioned above in the article to get relief from the allergies. Can this help with cat allergies? Yes, it can. Try it and share your experience. I drink every morning a glas of fresh pressed orange juice with a half spoon tumeric, ginger in small pieces, chayen pepper and black pepper. I do this since 2 month. It change my energie my mood and i have almost no allergies, clears the sinus.Its amazing mother nature.. I just love it.